Heat oven to 375°F. In large bowl, beat butter, shortening, sugars, vanilla and eggs with electric mixer on medium speed, or mix with spoon. Stir in flour, baking soda and salt (dough will be stiff). Stir in chocolate chips and chocolate candies. On ungreased cookie sheet, drop dough by level teaspoonfuls or #70 cookie/ice cream scoop about 2 inches apart. Bake 10 to 11 minutes or until light brown (centers will be soft). Cool 1 to 2 minutes; remove from cookie sheet to cooling rack. Making these cookies will go a lot faster if you use a cookie/ice cream scoop. Level off the cookie dough in the scoop on the edge of the bowl. Make Four-Chip Cookies by using 1 cup each semisweet chocolate chips, milk chocolate chips, white vanilla baking chips and butterscotch chips in place of 2 cups semisweet chocolate chips and the chocolate candies. These scratch-made chocolate chip M&M’s Christmas cookies belong on every cookie tray! 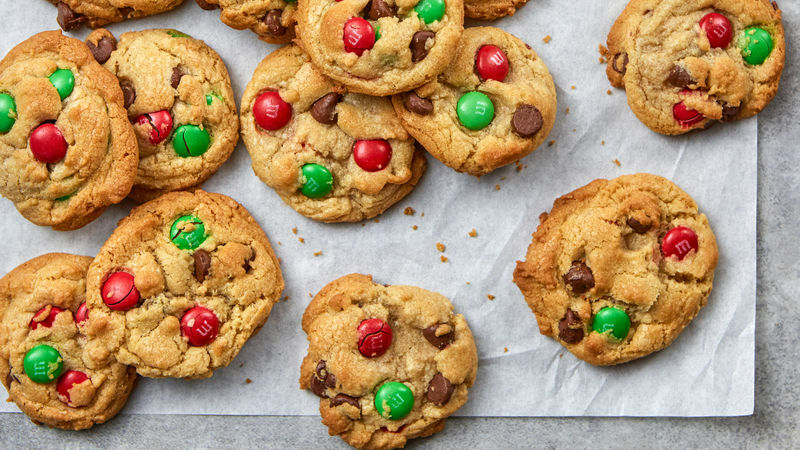 They have all the flavor of a traditional chocolate chip cookie but with twice the chocolate and a splash of festive color -- thanks to the red and green M&M’s. Kids young and old will scoop these up by the handful to enjoy with their favorite drink. We love the idea of packing these up in little cellophane baggies to hand out to family and friends during the holiday season. To make sure these giftable treats turn our perfectly every time, check out Betty’s cookie cheat sheet. And if M&M’s aren’t your thing, but you love the idea of gifting chocolate chip cookies, Betty had hundreds of chocolate chip recipes for you to choose from.